It’s the season of giving, and we need your help to give four children the gift of life! Make a once-off donation of R100 or more during the’ Give a little, save a life’ campaign, and you could win prizes including vouchers, luxurious holidays and spa treatments. At the end of each year, we at the SABMR like to count our blessings. To date, we’ve helped save the lives of over 400 patients with life-threatening blood disorders by matching them with healthy, unrelated bone marrow donors from South Africa and the rest of the world. This December, we need your help to raise funds for our latest funding initiative. Sadly, there are patients who lack the financial resources to cover the donor-related costs of a bone marrow transplant. 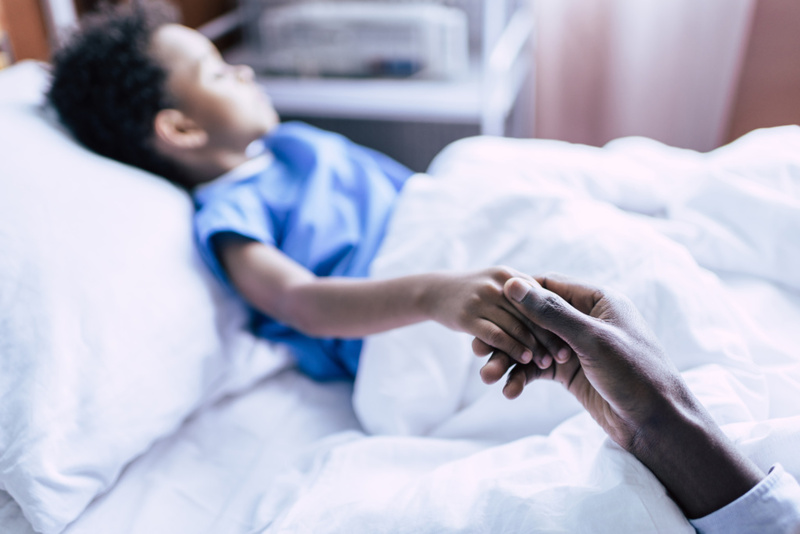 The SABMR’s new Patient Assistance Programme will support these patients, as our goal is to ensure that every adult and child referred to us can have the best chance at getting that life-saving transplant and going on to lead a full life. Currently being treated at a state hospital in the Western Cape. Both have a hereditary form of anaemia, referred by a state hospital in Limpopo. This is an extremely rare case: one child in the family was diagnosed with the blood disorder; shortly afterwards the parents discovered their other child had the same disorder. You can help these children by making a once-off donation during the ‘Give a Little, Save a Life’ campaign. Thanks to our 22 generous sponsors, you’ll stand the chance of winning prizes worth a total of almost R100,000, including getaways, spa experiences, golf days, wine, restaurant meals and more. Our prizes are organised in three tiers. For once-off donations of R100 or more, three names will qualify for prizes worth R5000 each. For donations of R2000 or more, three prizes to the value of R10,000 each can be won. For donations of R5000 or more, you could stand a chance to win the grand prize, valued at R25,000: a two-night holiday for four at the Colosseum Luxury Hotel Presidential Penthouse in Cape Town, including spa treatments, cinema tickets, a cruise and perfume! There are also a number of spot prizes to be won throughout the campaign. Weekly prize draws will be held throughout December, January and the first two weeks in February, with the draw for the three big prizes taking place on 14 February 2019, the culmination of our campaign. We look forward to your support in this special drive during the season of giving. Thank you for helping us give someone the gift of life this festive season! The only bone marrow registry in Africa with World Marrow Donor Association (WMDA) Qualification status, the SABMR is now recruiting its own donors and better typing all donors on the Registry, as well as raising funds to support these activities. CAPE TOWN – An internationally recognised registry with a 27-year track record of meeting transplantation requirements, the South African Bone Marrow Registry (SABMR) is moving ahead to improve the quality of the tissue typing of donors on the Registry, by using more recent sensitive technology available. This will make the matching of donors for patients in need of transplant more accessible and a faster process. The SABMR is now recruiting its own donors. A key issue in SABMR choosing this path was the decision of The Sunflower Fund (TSF) to sever relations with SABMR and no longer recruit donors for the SABMR. In addition to starting their own registry, TSF’s new initiative includes setting up an HLA Data Centre for Africa, partnering with other developing registries on the African continent and the Caribbean, and providing HLA data to researchers for revenue generation. The SABMR is moving on and going digital to recruit and maintain our existing registry to improve quality and ensure stem cell bone marrow donors are and remain available to our patients in need. In addition, we will be offering a patient assistance program to indigent patients in need of bone marrow transplants in South Africa. According to international protocol, a donor may only be listed on one recognised registry. This is to avoid donor duplications, which may increase the time it takes to find a life-saving bone marrow match for a desperately ill patient. We would therefore encourage all potential donors to contact the SABMR directly to become a donor. Founded in 1991, the SABMR is a member of the World Marrow Donor Association (WMDA) and an internationally recognised registry. It has been the only registry in Africa supporting an active matched unrelated donor transplant programme. Besides facilitating stem cell transplants for South African and international patients, the SABMR also assists in international family transplants as well as searches to identify matching donors for patients who are refractory to blood platelet transfusions .As an established Registry, the necessary skills, technical infrastructure and expertise already reside within the SABMR to deliver services for patient searches, matching and co-ordination of procurement and harvesting of stem cells, and delivery of the product to the patient and clinicians. Please note the SABMR is a not-for-profit public benefit organisation which receives no financial assistance from government and operates on a cost-recovery basis for services provided to patients in need of transplant. Hence our call for financial assistance, as The Sunflower Fund is no longer assisting to recruit donors for the SABMR. To make a financial donation to the SABMR, please go to www.sabmr.co.za and click the ‘Donate’ button. 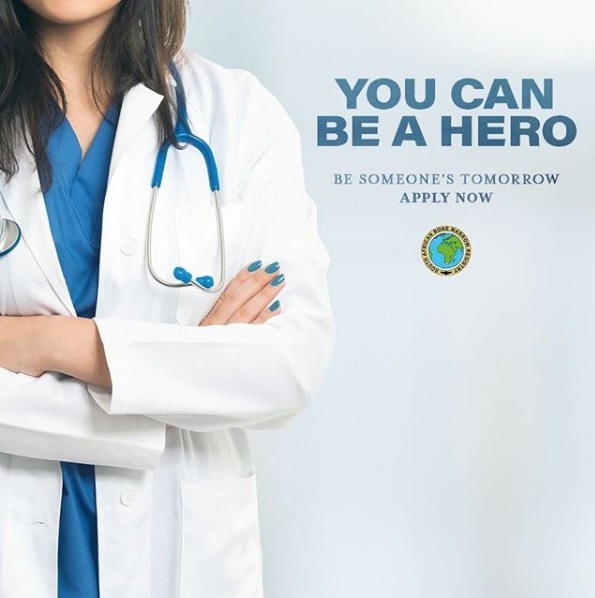 By becoming a bone marrow stem cell donor or by making a financial donation, you play an extremely important role in making more tested donors available on the registry for patient bone marrow transplants. As we move forward, the SABMR would like to thank The Sunflower Fund for their previous commitment and contribution to the Registry, and wish them well in their new initiative. For more information, please contact The South African Bone Marrow Registry. The 2015-2016 period has been a time of celebrations and milestones for the South African Bone Marrow Registry (SABMR). Our organisation, which exists to find matched unrelated bone marrow donors for critically ill South African children and adults, has seen the retirement of its pioneering co-founder and Medical Director, Professor Ernette du Toit, and the appointment of Dr Charlotte Ingram as Medical Director. In January 2016, the SABMR achieved Qualification Status with the World Marrow Donor Association (WMDA). The is the first step in the process of becoming accredited with the WMDA. Discovery Health are thanked for providing the funding to enable us to achieve this goal. 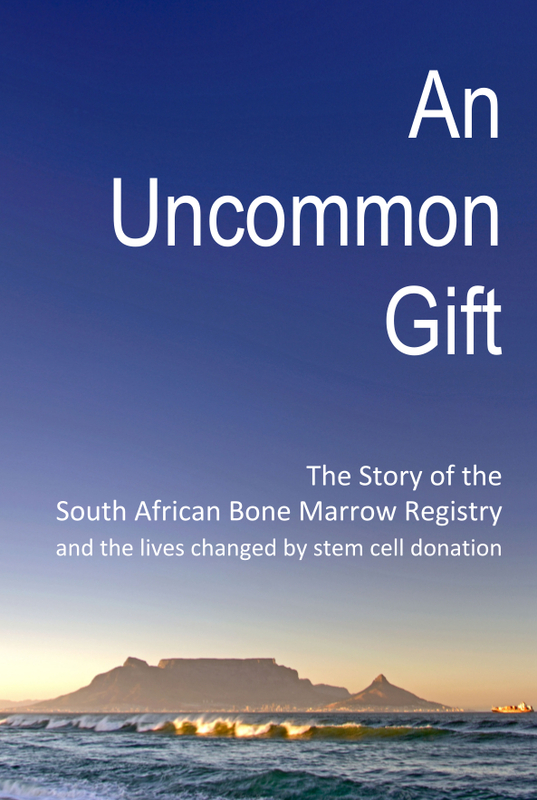 In September 2016 we marked the 25th anniversary of the founding of the SABMR with an event at the V&A Waterfront and the publication of a book, An Uncommon Gift: The story of the South African Bone Marrow Registry and the lives changed by stem cell donation. 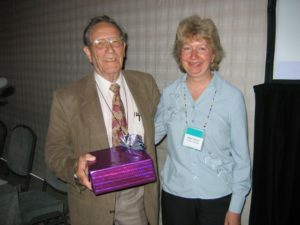 Professor van Rood with Susan Cleaver, Manager, Anthony Nolan, Cape Town, May 2006. Jon van Rood had a special interest in the HLA typing of the Southern African populations and encouraged Professor Ernette du Toit in the founding of the South African Bone Marrow Registry. 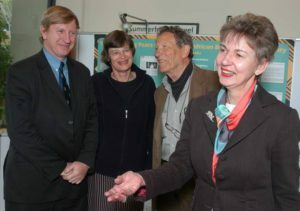 He was a guest of honour at the 6th International Donor Registry Conference of the World Marrow Donor Association which was hosted in 2006 Cape Town by the SABMR. At this meeting he was the recipient of the Shirley Nolan Award, delivering the Shirley Nolan Lecture. His fondness for HLA typing was matched only by his fondness for sailing and it was almost mandatory for visitors to his laboratory to be taken sailing. When SABMR asked him for a favourite photograph to illustrate his lecture, he immediately supplied one of him on his boat! He will leave a void, both personal and academic. Pictured at the WMDA 6th IDRC, Cape Town, May 2006 From left: Professor Jeremy Chapman, WMDA President; Dr Machteld Oudshoorn, Professor Jon van Rood, Professor Ernette du Toit.